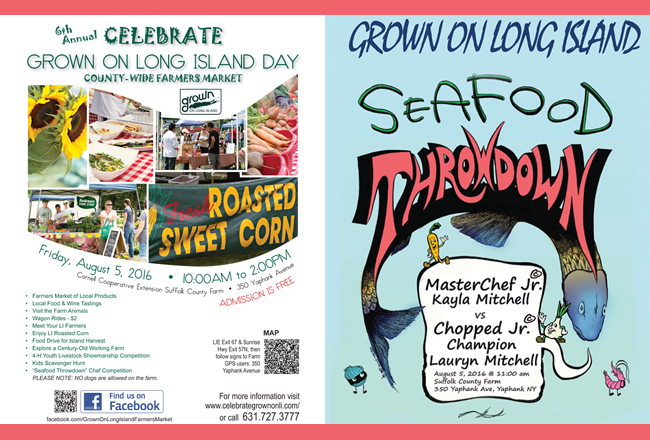 On YouTube: Fifth Annual Seafood Throwdown at "Celebrate Grown on Long Island Day"
NOTE: Click here for some photos taken at August 2016's Seafood Throwdown, which appear at the end of this news item. 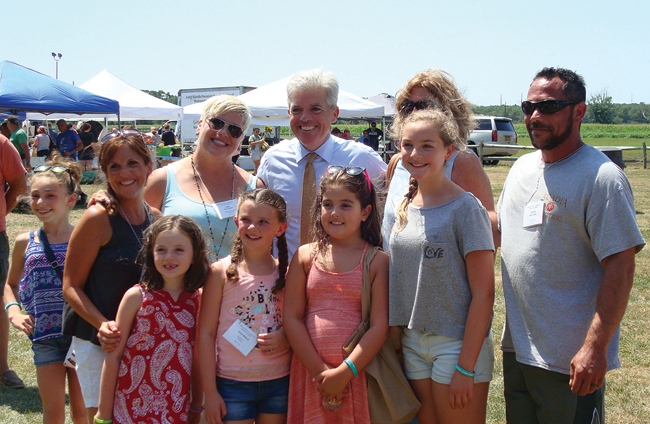 Yaphank, NY, July 28, 2016 - On Friday, August 5, 2016, Cornell Cooperative Extension, Long Island Farm Bureau, New York Sea Grant and partners invite you to the 6th Annual “Celebrate Grown on Long Island Day” at the Suffolk County Farm in Yaphank from 10am to 2pm. Purchase local in-season Grown on Long Island produce from the Farmers Market, meet local farmers, and enjoy roasted corn, wine, and food tastings. Kids can visit the educational animal yard, ride farm wagons and more. At 11am stop by New York Sea Grant’s Fifth Annual Seafood Throwdown. 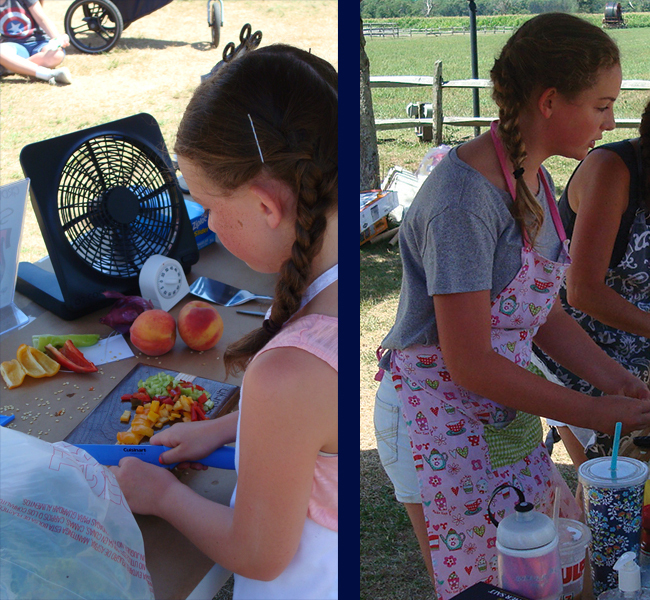 This year’s exciting competition will be historic when Kayla Mitchell who appeared on MasterChef Junior in 2015 faces off with her sister, Chopped Junior Champion Lauryn Mitchell who won the title on July 5, 2016. 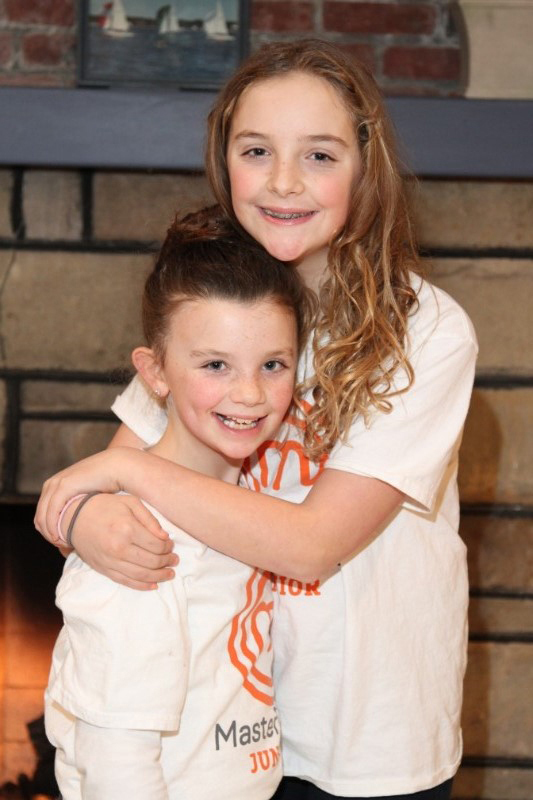 In the photo above, Lauryn gives her big sister Kayla a hug. Photo Credit: Barbara Lassen / Dan's Papers. “In the kitchen is where my daughters shine—I can’t believe we are on this ride together,” said Michelle Mitchell, mother of the competing chefs. She will be sous chef for daughter Kayla while their uncle Eddie Ciappa will do the same for Lauryn. The young chefs will receive a seasonal mystery seafood and local produce item courtesy of local farms and fishermen. They’ll have a little time for a mad dash to the Farmers Market to buy other Grown on Long Island ingredients to round out the dishes to present to the judges. A past year paired “porgies and beets” and last year, “monkfish and horseradish.” What will the mystery ingredients be this year? New York Sea Grant's fisheries specialist, Antoinette Clemetson, said “Fishermen have much in common with small farmers. We are working with fishing businesses to help establish community supported fisheries (CSF) programs similar to the more familiar community supported agriculture (CSAs).” The seafood throwdown is adapted from New England fishing community events held by the Northwest Atlantic Marine Alliance (NAMA). FREE ADMISSION. The Suffolk County Farm is right off the LIE at Exit 67 South. For more info visit www.celebrategrownonLI.com or call the Long Island Farm Bureau at 631.727.3777. “The seafood throwdown is another way that Sea Grant can bring attention to the benefit of supporting local seafood and the farm to table movement," says NYSG's fisheries specialist Antoinette Clemetson. Lauren Mitchell was the most recent champion of 'Chopped Junior,' officially winning the honor in early July 2016. Photo: Newsday. 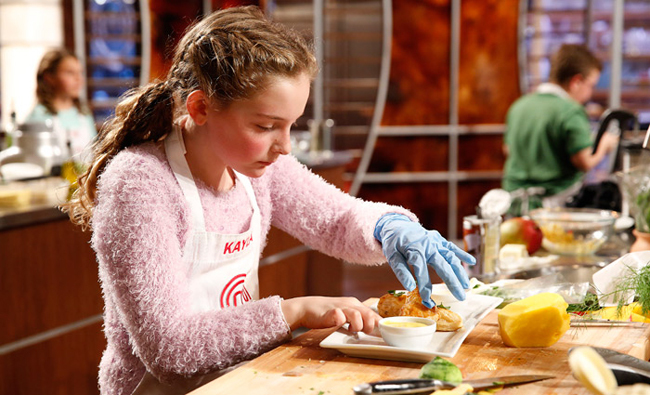 Kayla Mitchell competed On 'MasterChef Junior' in 2015. Photo: TheTVPage.com. Lauryn Mitchell not only won Chopped Junior, but, as Yahoo News discovered, she also won the hearts of viewers as the little chef’s cooking style could be described as "sophisticatedly adorable." 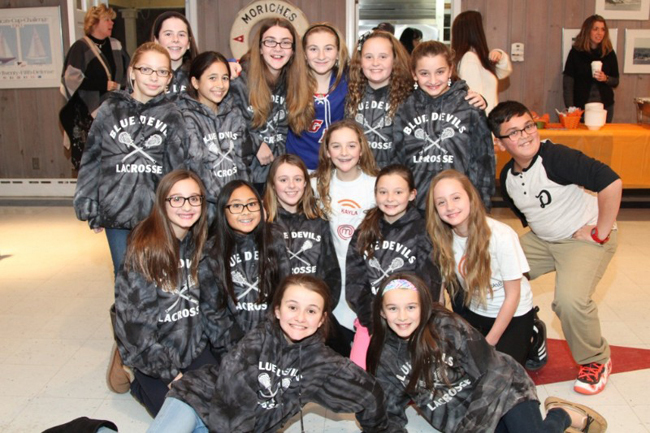 Center Moriches' Lauryn Mitchell, 10, began competing for a $10,000 prize on Food Network's "Chopped Junior" in February 2016. On Tuesday, July 5th, the family held a viewing party for the show's finale. On each episode of the show, four young cooks compete, and are eliminated one by one after cooking an appetizer round, a main course round and a dessert round. Lauryn couldn’t give away in advance what she cooks on the show, but some of her favorite things to prepare are steak and burgers stuffed with cheese. “I wanted to do this because I followed after my sister’s footsteps,” says Lauryn, whose older sister, Kayla, 13, appeared on “Master Chef Junior” in 2014. Kidsday reporters Erin Wuestmann, Connor McNeill, Sean Nolan and William Dietz, all from Bayport, interviewed "MasterChef Junior" contestant Kayla Mitchell at her house in Center Moriches, Long Island, NY. Credit: Newsday/Pat Mullooly. 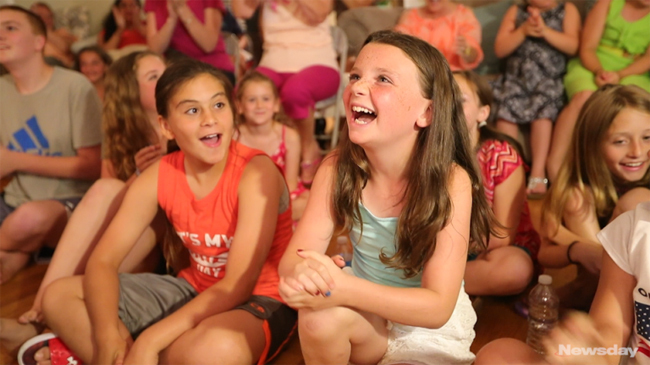 Friends and family of Kayla Mitchell gathered for a viewing party in Center Moriches as they watched Kayla compete on "MasterChef Junior." Credit: Randee Daddona. "Grown on Long Island Day” is a celebration of the area's local produce. Long Island is home to 35,000 acres of working farms growing over 100 varieties of products. The local greenhouses, farm fields and vineyards are what make this region so special and the investment into our own community is vital for our region to flourish. To find a Farmers Market nearest you, check out the map feature on Grown on Long Island's Web site.